There are also these identical-looking Bheka mats from Ray at YogaLifestyle who sells me my blankets. buy a longer belt (8 foot +) for Door Dog. I highly discourage the use of thick belts, D, ring belts or any kind of plastic buckle for door dog. Ray is the same Ray as above with the Bheka sticky mats. He will know the firmness/thickness/quality of the blanket you need but ONLY IF YOU CALL HIM DIRECTLY AND USE MY NAME. You may even get glitter upon request! (although that seems to be a random kind of thing) AND anyone using my name gets a discount. Wash blankets in cold water and air dry when they get dirty. These are the best bolsters and sandbags made. Ask for customized extra long handles for your sandbags. you can buy through me. Also available at Samamkaya if you pick up in person. If you just want a couple of play bricks get them from Tools for Yoga. Here is a sock you can wear while you practice with a heel lift. These are available at most Duane Reade/Walgreens stores. Great for back traction and back pain relief. This is the best one and it has adjustable height. If you have a rope wall, just order the sling and buy carabiners at your hardware store to clip it onto your hooks. If not, you can hook it over your door (make sure you’re on the closed side of the door and the door is locked!) with the over the door hangers. The Regular Wall Pelvic Swing is used without the Yoga Wall™. You can also use it With the Over the Door Hanger. For your home your rope wall can be just one panel with 4 hooks or even just one hook in the wall! You do want a professional contractor to make sure it is done securely. The hooks we use are square to give people with scoliosis better proprioceptive feedback. The wide hooks were custom made for us and we designed them. They are steel rods with threading on either end and bent into a square shape. A washer fits in front of the plywood, and an extra secure bolt in the back. Go by the measurements in Lois Steinbrrg's books for height and spacing. If you live in NYC your contractors can come by my studio or Samamkaya to see how the plywood is mounted on a frame and the frame into the studs and how the screws in the plywood should be screwed into the frame symmetrically. You can buy pre-made yoga ropes online at Tools for Yoga or at Yoga Props. A set of four custom sized ropes can also be purchased from a local San Diego supplier who I highly recommend for great quality ropes. 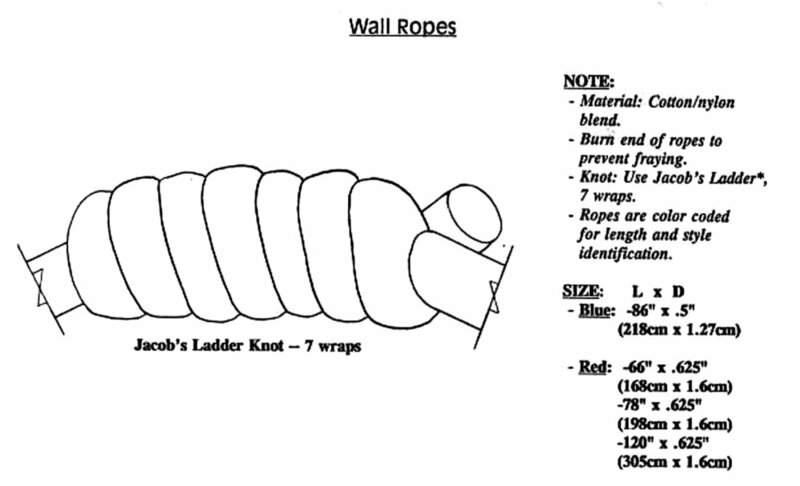 The San Diego supplier will custom tie the ropes to spec for your particular rope wall and has two thicknesses of rope to choose from. They are happy to mail out of state. Contact them at marucayog(at)gmail.com. buy Nautical Sta-set ropes if you want to tie your own. There are several short YouTube videos which show how to tie the ropes in the triple fisherman’s knot classically used for the rope wall: here, here, and here. Here is one of many nautical suppliers which is one of many possibilities for buying rope. Buy sta-set ropes, otherwise your ropes innards will herniate! Diameter is in Lois Steinberg diagram above. Leave $ in plastic basket under kettle with a note of what you took.